The first Patlabor film follows on directly from the original OVA series. Unlike the comedic OVA series, this film for the most part is a drama. A very clever film for it's time. Before computer viruses became rather common, this film showed what potentially could happen, and showed how far it could spread. Like the OVA series, there isn't a lot of Labor action, with only four short action sequences. Most of the film follows the uncovering of Eiichi Hoba's grand scheme. Oshii used quite a lot of animal motifs in the film, mostly bird shots. These would become a trademark of the Patlabor films. There is also the motif of cages which can be seen in Eiichi Hoba's old apartments he lives in. Oshii also uses fish-eye lens type shots for the first time in this film. Also of note is the amount of religious references in the film. Oshii uses them quite a lot in his films, especially his 1985 film "Angel's Egg". In 1998, Oshii reunited the cast members to re-record the dialogue for a Dolby Digital 5.1 channel remix. Additional music was also added by Kenji Kawai. The remastered version of this film was released on the home video in Japan in December 1998. The film was also the first Patlabor anime released to the English speaking world. Unfortunately the original English dub, produced by Manga Entertainment, bizarrely changes several lines including one of the very few lines actually spoken in English. This changes the mood in several scenes. The changes include the following; when Noa and Asuma come to pick up Shinobu from the Ark at the beginning of the film, they don't seem to know who she is. Also before they arrive there, the helicopter pilot's dialogue has been changed to sound like he's running a tour or something! When Division 2 is called out to fight the beresk Labor, the pilot's line about how he's doomed because Division 2 is rescuing him is changed, which makes Ota look like he's getting angry for no reason. Also in the same sequence the helicopter pilot sounds like he's commentating on a wrestling match, when in the original he's just questioning Division 2's tactics. The final one is bizarre. In the original, an airport official asks Kanuka in English, "Sightseeing? ", and she answers back in English, "No, combat". This has been changed to; "Occupation? ", "Labor Pilot". Why change good English lines into something duller and quite obviously not humorous at all? For these reasons, either the subtitled version or the new vastly superior dub produced by Honneamise/Bandai Visual is recommended over the inferior original English dub. Maiden Japan released the film in the US on Blu-ray and DVD with an English dub, original Japanese dialogue and English subtitles, but no extras. In Japan the movie is available on Blu-ray with an English dub and English subtitles from Bandai Visual/Emotion. Panorama released the film in Hong Kong on Blu-ray and DVD with the Japanese dialogue, English subtitles as well as well as an optional Cantonese dub and Chinese subtitles but no extras. The Maiden Japan DVDs and Blu-rays are only available in the US, and therefore will only work on DVD/Blu-ray players that are both NTSC compatible and will play region 1 DVD discs and region A Blu-ray discs. The Bandai Visual/Emotion Blu-ray discs are only available in Japan and will only work on NTSC compatible and region A Blu-ray players. The Panorama DVD and Blu-rays are only available in Hong Kong, and therefore will only work on NTSC compatible and region 3 compatible DVD players and region A Blu-ray players. If you don't live in these countries, check your player's instruction manual to see if it will play the discs. Please see the English Language Movie Releases Video List for a complete listing of all releases, formats and product specifications for this movie in English. This movie is available in Japan from Bandai Visual/Emotion on DVD and Blu-ray. The DVD version does not come with English subtitles or an English dub, however the Blu-ray release comes with the new English dub and English subtitles. These discs are only available in Japan, and therefore will only work on DVD and Blu-ray players that are both NTSC compatible and will play region 2 DVD discs and region A Blu-ray discs (if you don't live in Japan, check your player's instruction manual to see if it will play the discs). Please see the Japanese Movie Releases Video List for a complete listing of all releases, formats and product specifications for this movie. A GWEI Product. ©2003 - 2018 GWEI. 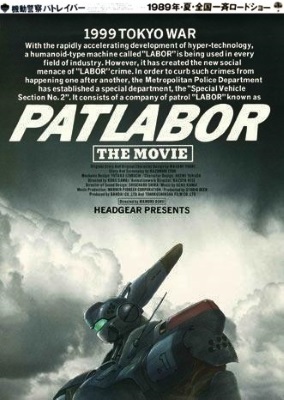 Patlabor the movie ©1989 Headgear/Emotion/TFC. All other logos/trademarks are copyright of their respective owners/companies. Used for review and illustration purposes only.